Andrew Johnson, executive director of the American Indian Center of Chicago, speaks at the Native and Indigenous Northwestern Community Forum Tuesday evening at Harris Hall. Johnson voiced his support for the efforts undertaken by the Native American and Indigenous Student Alliance to push NU toward a reconciliation process regarding John Evans’ role in the Sand Creek Massacre. 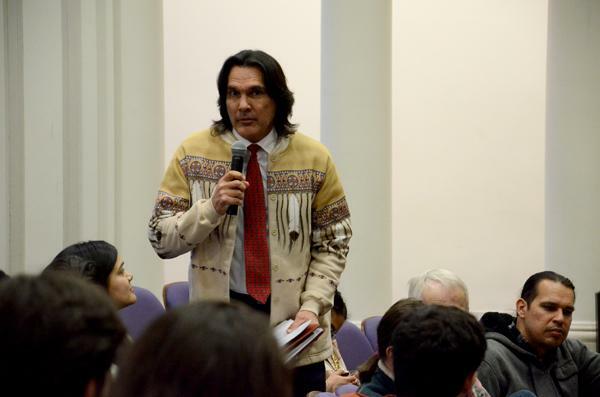 The Native American and Indigenous Student Alliance held an open forum Tuesday to discuss the indigenous community’s response to Northwestern’s approach to determining John Evans’ role in the Sand Creek Massacre. NU founded the John Evans Study Committee in February 2013 to examine John Evans’ role in the Sand Creek Massacre. The massacre resulted in the killing of more than 100 members of the Arapaho and Cheyenne nations in the Colorado Territory while Evans was governor of the area. During Fall Quarter, the John Evans Study Committee held an open forum for community members to give feedback. Following the open forum, the University fast-tracked a second committee to determine how it can improve the current campus climate for Native Americans. The second committee was originally set to be formed after the first committee releases its findings in June. While the committees were founded to reach out to the Native American community on campus, NAISA co-president Heather Menefee, a Weinberg junior, said the University’s approach has not been transparent. The John Evans Professor of Sociology Gary Fine said the University has always shied away from facing its troubled past. He said he questioned the role of John Evans in the massacre in 2004, but the University failed to act until last year. Andrew Johnson, executive director of the American Indian Center of Chicago and a member of the Cherokee Nation, demanded NU be more open about issues of inclusion on campus. After the open forum earlier this academic year, several people have asked for a video recording of the event. Despite the requests, NAISA members said, the professor who has it will not release the recording. The first committee has also not released minutes from its meetings, and one member is from a Native American nation. Menefee and co-president Forrest Bruce, a SESP sophomore, are part of the second committee and said it plans to meet again next week. They noted unlike the first committee, representatives from the Arapaho nation were present when the second committee met. However, there is not a representative from the Cheyenne nation, even though several were nominated for the research committee, including Henrietta Mann, who spoke on campus in November. “If there’s no Cheyenne member in the second committee, then again we’re excluding the Cheyenne community from determining how this whole process will work out,” Menefee said. Menefee added the only member of the committee she saw at Mann’s lecture was Patricia Telles-Irvin, vice president for student affairs. People at the forum also discussed the movement’s future, with several speaking in favor of a campus-wide protest on the 100th anniversary of the massacre in November. Eli Suzukovich, a post-graduate research fellow in the psychology department, said the University will notice what the group is doing. Correction: This story has been updated to reflect that one member of the initial John Evans study committee is from a Native American nation. The Daily regrets the error. The story has also been updated to clarify the circumstances regarding Henrietta Mann’s nomination to the committee and the request to release the video of the open forum.